So as most of you probably already know I did a video on Sparta, Ga in Hancock County for my Youtube channel for this project talking about all of the suffering in Sparta since the loss of the Sparta Furniture Factory at the end of the 1990s. Many of the old small business buildings in Sparta now sit empty and decaying and it’s really sad, but after I posted my video I had a comment from Robert Currey, the owner of Currey & Company, who is now a resident of Sparta and he was not happy with me for my negative coverage of Sparta. My intention as I worked on this project and expanded to videos as well was not to only cover the negative but also any positives in each county as well. I love it anytime I find one of these empty buildings is bought and repurposed by someone else and the building put back into service as a small business. I have recently seen it in a couple of the counties I have been too and when I shot the original video, I did not know about all of the great things that Robert and his wife Suzanne have done in this small city. The Currey’s bought an 1840s Greek Revival home in 2002 and moved to Sparta and started renovating it and currently live there. Robert decided he wanted to do some gardening in his back yard and that garden turned into a 10 acre urban farm that he and his wife have named Elm Street Gardens and the fresh vegetables they grow there are sold in local Atlanta area Farmer’s Markets and restaurants. 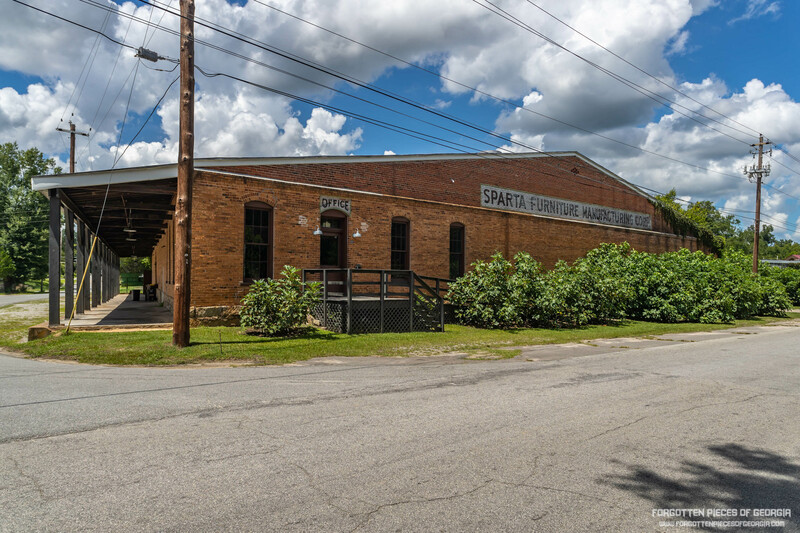 In addition, Robert also purchased the old Sparta Furniture Factory pictured above and he has fixed it up and is now using the building for a new venture called Sparta Mushrooms, where they grow high quality shiitake mushrooms that are in turn sold at Atlanta high end restaurants as well as the Atlanta Farmer’s Markets. If you know anything about gourmet food, shiitake mushrooms are highly sought after by chefs for their unique, earthy taste and they can add a LOT of flavor to their dishes. This past weekend I went back down to Sparta not only to shoot, but also to meet with Carly Marchman, the Editor of the Sparta Newspaper as she would like to work with me on some original content for the paper. I was interviewed by her for about 2 hours at the paper’s office and then after a bite to eat, I stopped by the Currey’s home to meet with Robert and Suzanne. The Currey’s are wonderful, down to earth people and they made me feel very welcome at their home, even though Robert was not originally happy with me over that first video. After spending a couple of hours talking to Robert and his wife and photographing their urban farm and the mushroom factory, Robert warmed up to me and even said I could stop by again when I am back in Sparta shooting for the newspaper. I have new photos and video footage and will be posting that video to Youtube soon so make sure you stop by and Subscribe and turn on notifications.